Lois Bresnahan, shuttle tatter, and guild member since 2000 (or 2001). I can’t remember when I didn’t know about tatting. As a very small child I lived around people who were immigrants. Most of the women friends of my paternal grandmother crochet, knitting, or sewing, embroidery. Some of them were master lace makers of one kind or another a few of them tatted as well. My maternal grandfather’s mother was a tatter. I’d spend part of my summers with her watching her tat. On my 17th birthday, September 14, 1967. We hope you have a Happy Birthday! My great-grandmother taught me. She showed me what the stitch would how to make each half of the double stitch on a piece of large twine; let me try a few stitches with it till she thought I had the idea. Then she handed me a handwritten pattern and a metal Bates shuttle wound with 120 silk thread told me to start tatting. The woman could be cruel. I made a lot of mistakes and she would patiently help me fix them. I know that shuttle would look like it was running out of thread before I went to bed, but the next morning it would still be attached to what I thought I did the day before and the shuttle would be full! 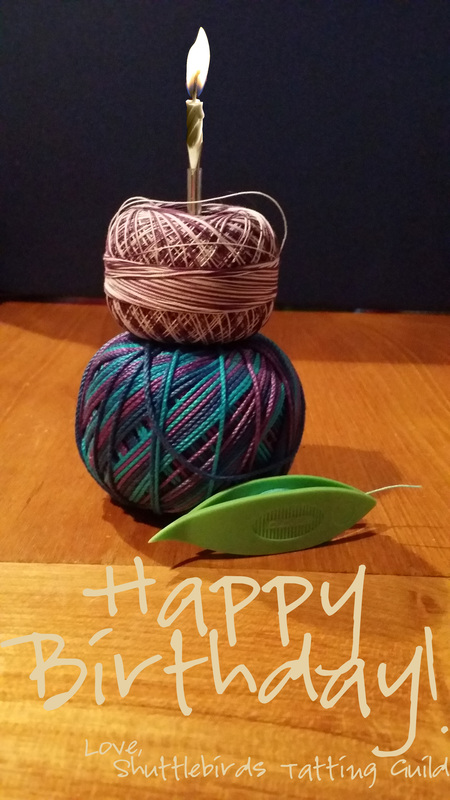 What tatting skill(s) do you want to learn? I made a table cloth for my step daughter for her Hope Chest and then the edging for her long wedding veil. I also made the short veil that covered her face using a fine silk thread using the mignon technique. I also did the collar and cuffs for her dress. Don’t really have a favorite designer. There are too many wonderfully talented designers out there with their own special talents. I like most of the Japanese designers. Love Jane E.’s designs, love the late Tatting Goddess, Gina’s patterns, Linda Davies 3D flowers are wonderful. I could go on and on but I won’t. I don’t really have a favorite book. There are two books I’ve had to replace; “Tatted Treasure Chest” and Mini Tats. They both literally fell apart from over use. I really don’t have a favorite thing to tat. I tatted a lot collars for my granddaughter to wear when she was performing until she learned to tat herself. I’ve done snowflakes for each of my grandchildren from the year they were born. Now I’ve added Max. I tend to tat whatever looks interesting. I like tatting ornament covers, edgings, doilies. I guess whatever I’m working on is my favorite thing. I like bright happy colors for the most part, love some of the muted colors that Majestic had, I’m fond of most of the pastels. Guess my favorite color is kind of like my favorite thing to tat. Whatever I’m working with at the time. I love DMC’s Coronet Special (too bad it only comes in white), absolutely loved Handy Hands’ Flora size 50 (too bad they don’t make it any more), Sulki is one I like to use. The new Lizbeth thread is ok for the most part. Valdani is nice thread and King Tut. Generally I’ll tat with anything that will give me good results. I’ve done two ornament covers my daughter’s short veil. I’ve played with making different little motifs to put together. Whatever I’ve just finished, usually. Most recently a 3D rose by Mary Konior. I play tournament poker. A clover shuttle is my card protector. I’m reading the collected works of Jane Austin, right now. I like playing with beads. I like playing with graphics on the computer. I just wish there were more hours in the day. 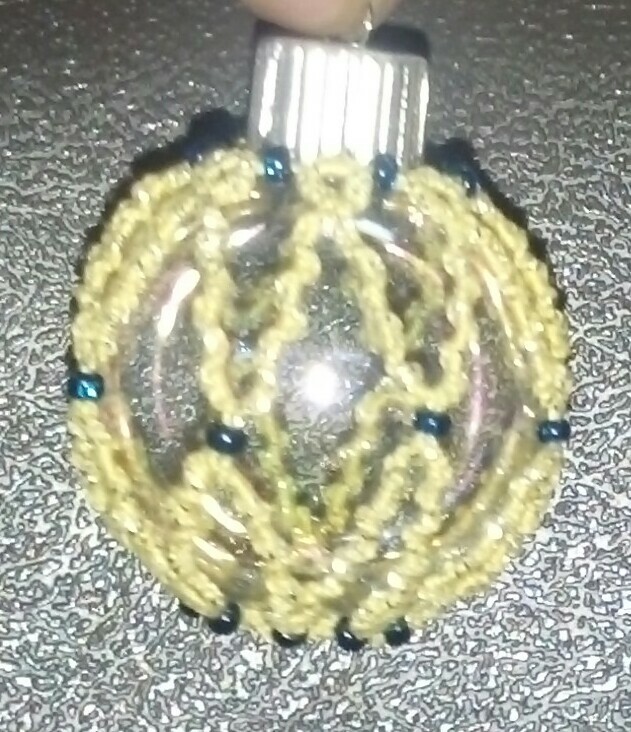 Lois Bresnahan has been busy tatting up ornaments. She is doing a lovely job. 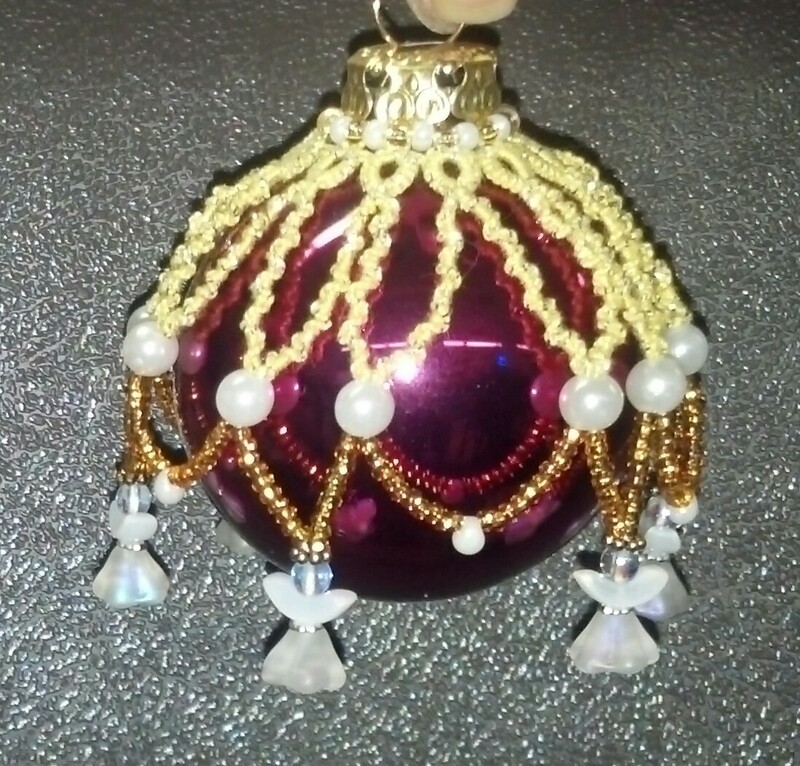 I especially enjoy the ornament with the adorable angel beads. Tune in tomorrow to learn more about Lois, as she will be featured as the Tatter of the Month.